Isla is absolutely obsessed with Peppa Pig, if I let her she would watch it over and over again! Not to mention the numerous t-shirts, slippers, hats all emblazoned with Peppa. In order to satisfy her thirst for all things Peppa she even went to Peppa Pig World this summer and tomorrow is going to see Peppa Pig Live, so you see we have a true fan on our hands! So when we were sent 'International Day and Other Stories to review she was so excited and if I'm honest so was I because it has episodes with my favourite character - Grampy Rabbit! Who can resist a character voiced by Brian Blessed?! Needless to say this DVD has already been watched 4 times in 3 days so I think it has Isla's seal of approval. I love watching her reactions to the characters and hearing her giggle to the tales of this cheeky piggy! Who is Peppa Pig's best friend? Please leave contact details along with your answer so I can get in touch should you be the winner! Entries need to be in by 24th October. Peppa Pig, the UK’s No. 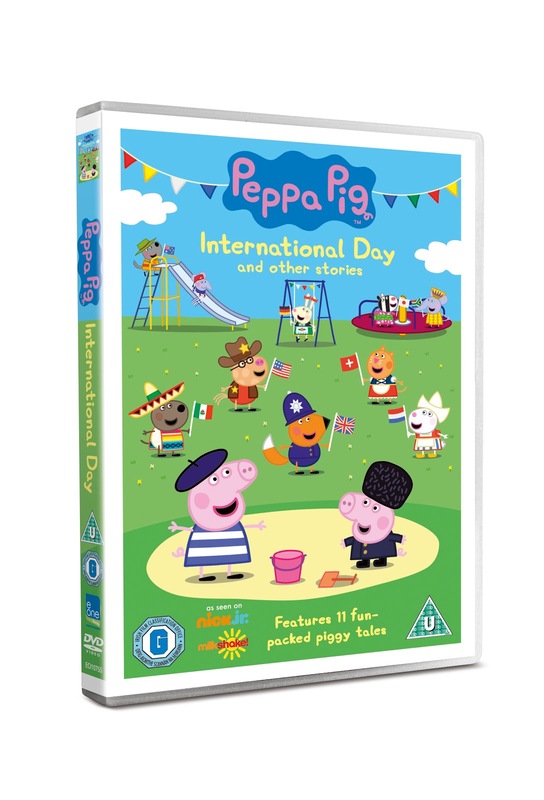 1 pre-school character, returns to entertain your little ones this autumn in a brand new DVD Peppa Pig International Day and Other Stories. Available from Monday 24th October 2011 (£12.99 RRP, Cert U, Entertainment One) just in time for the school and nursery half term break, the DVD is packed with 11 fun-filled tales about Peppa Pig and her family with all the joy and laughter we’ve come to expect from this adorable character. Peppa Pig is a loveable, cheeky piggy who lives with her little brother George, Mummy Pig and Daddy Pig. Peppa’s favourite things include playing games, dressing up, days out and jumping in muddy puddles. Her adventures always end happily with loud snorts of laughter. Join Peppa Pig and her little brother George for the lead International Day episode, where Peppa and all her friends at playgroup dress up as different countries from all over the world, and 10 other adventures that will have the whole family singing Peppa Pig – Oink Oink! susie sheep! I should know - we are always watching peppa in our house! @tracyknixon on Twitter! Thanks so much for the giveaway! My two daughters are huge fans! Susie sheep is peppa's best friend. Lol my last comment of course should have said blog not bog! now I am feeling sheepish! Answer is (c) Susie Sheep. My little girl is peppa mad! This would be a great stocking filler and calm her right down after all the excitement xmas morning! My little girl loves peppa!! Its susie sheep! and what are the secret words? Daddies big tummy! The answer is C) Susie Sheep.